Just a note to say thank you on this special day here in the U.S. Words alone are not enough to express my gratitude for each and every one of you who visits All Things Paper. 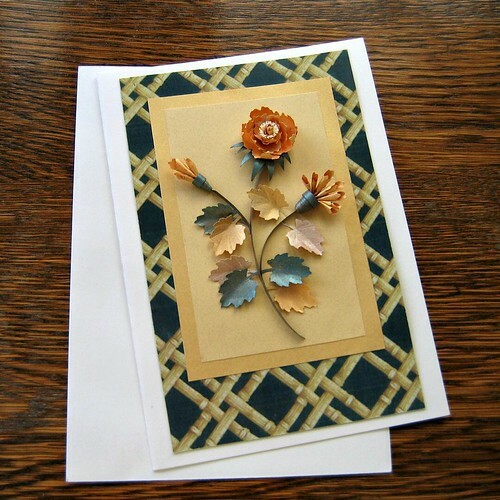 I made this card to devise various ways of using a hawthorn punch. While looking at the photograph, I realized the design (funnily enough) reminds me of hands waving... totally apropos for the occasion. So a heartfelt greeting from me to you along with thanks for reading along no matter where you live in this fine world of ours! Thank you, Maureen! I hope you had a nice Thanksgiving. I've always admired this card and the patterned background sets off the design nicely. I always got the impression of looking through a window.